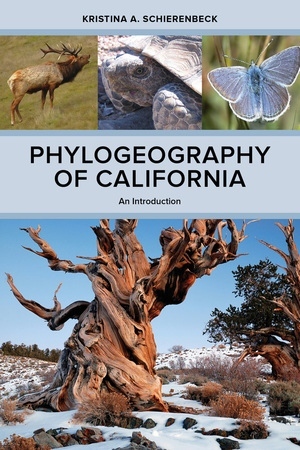 Phylogeography of California examines the evolution of a variety of taxa—ancient and recent, native and migratory—to elucidate evolutionary events both major and minor that shaped the distribution, radiation, and speciation of the biota of California. The book also interprets evolutionary history in a geological context and reviews new and emerging phylogeographic patterns. Focusing on a region that is defined by physical and political boundaries, Kristina A. Schierenbeck provides a phylogeographic survey of California’s diverse flora and fauna according to their major organismal groups. Life history and ecological characteristics, which play prominent roles in the various outcomes for respective clades, are also considered throughout the work. Supporting scholars and researchers who study evolutionary diversification, the book analyzes research that helps assess one of the major challenges in phylogeographic studies: understanding changes in population structures shaped by geological and geographical processes. California is one of only twenty-five acknowledged biological hotspots worldwide, and the phylogeographic history of the state can be extrapolated to study other regions in western North America. Further consideration is given to implications for conservation, recommendations concerning the biogeographic provinces that roughly define the state of California, and predictions related to climate change. Kristina A. Schierenbeck is Professor of Biological Sciences at California State University, Chico, and a passionate advocate for conservation. She teaches evolution, plant diversity, and systematics. Her research has focused on plant evolution, especially hybridization, invasive species, and rare taxa. She has authored and coauthored dozens of peer-reviewed scientific articles appearing in journals such as Proceedings of the National Academy of Sciences, Molecular Phylogenetics and Evolution, American Journal of Botany, and Molecular Ecology.